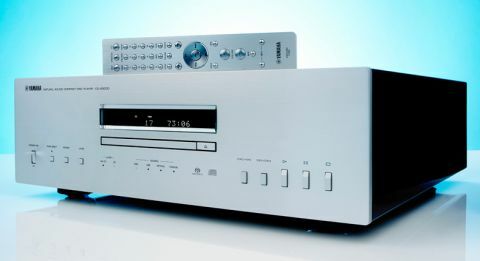 Yamaha CD-S3000 review | What Hi-Fi? It’s the little things that make a difference. In the case of Yamaha’s CD-S3000, it’s the disc drawer. Most rivals are happy using off-the-shelf rickety plastic drawers; the aluminium unit on the Yamaha glides out with grace. It wouldn’t count for much if the rest of the transport mechanism weren’t engineered to similar standards, but it is: with everything from the laser to the way the complete transport is mounted inside the casework carefully considered. One thing we learnt very quickly when testing the CD-S3000 is that Yamaha hasn’t chosen to do things the easy way. This classy player is heavy, weighing in at 19.2kg – as much as some pretty chunky integrated amps. Its casework is made up of thick aluminium plates and houses a generous power supply. The supply is configured with separate feeds for the analogue and digital sections of the circuitry, right down to dedicated mains transformers. This separation minimises any unwanted effects caused by the sections interacting. The result should be greater sonic transparency. Those two mains transformers are encased in copper housings to reduce any distortion caused by magnetic leakage and keep the amount of vibrations fed into the player’s structure at a minimum. Everywhere we look there are signs of attention to detail – from the carefully laid-out circuit boards to the neat arrangement for levelling the transport’s position inside the casing. Yamaha has even engineered the player’s feet so they can be used spiked or unspiked. This thoroughness continues to the casework, where fit and finish are absolutely top class. Every surface is finished immaculately and all the panels line up just so. The supplied remote control is suitably classy too, being nice to hold and easy to use. It’s becoming increasingly common for CD players to come with digital inputs. It makes sense: if your player has a high-quality DAC, why not make the most of it by routing other digital sources through the circuitry. The CD-S3000 comes with the usual trio of USB, optical and coax (all capable of accepting a 24-bit/192kHz music streams, with USB adding DSD capability to that). When we start using the CD-S3000 we realise its not a player for the impatient. Responses are a little dim witted, particularly when loading a disc or switching inputs. Given a few seconds it always does what you want though. We start with CD – an old favourite in the form of Rounds from Four Tet – and this Yamaha does well. It’s agile, detailed and delivers a decent dose of punch. Like its partnering A-S3000 amplifier, this player sounds really well balanced. There’s a hint of excess warmth, but all it does is to give the player’s sound a likeable solidity. Rounds is full of complex rhythms, and we’re pleased to report the CD-S3000 does a good job with them. It doesn’t quite have the hard-charging attitude of a Naim CDX2 or the leading-edge precision of Cyrus’s transport and DAC combination, but it remains composed, precise and delivers enough energy to keep us hooked. There’s a good degree of insight and an admirable level of composure when the music becomes complicated. We like the Yamaha’s punch too, and its way with dynamic shifts. There’s enough muscle here to deliver a sizable kick when necessary but plenty of finesse when the music requires. That finesse comes in handy when we listen to Beethoven’s Moonlight Sonata. This beautiful piece of music requires subtlety, resolution and fluidity to really shine, and the Yamaha obliges, putting in a spellbinding performance that has us gripped from beginning to end. The good news continues with SACD replay. Eric Bibb’s Good Stuff sounds luscious. The sound is smooth and richly detailed, delivering the heart-felt vocals with passion and forcefulness. We switch to the digital inputs and are happy with what we find. The on-board DAC reflects the surefooted presentation we hear with disc replay. Listening to a range of music, from Nirvana’s Nevermind to Elvis, it strikes us that we’ve stopped thinking about the Yamaha and have started focusing on the music alone. This is an understated player that just gets out of the way of the music. While it may not be the last word in any one respect, bar possibly build quality, it has enough talent to let the music shine. And, when you think about it, that’s what good hi-fi is all about.